Marvelous Multiagers! : It's Almost Party Time! Only half of a day left until break time!!!!!!!!!!!! These past few days haven't been horrific, so I am grateful for that! All I have left is the Christmas party tomorrow, yeah! 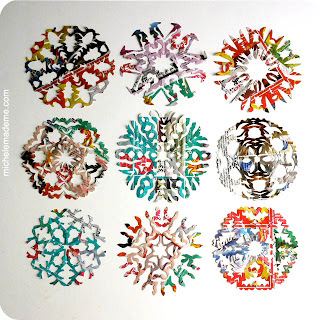 We made some junk mail snowflakes! Ours look a little more like junk mail with holes in it BUT they loved it and it didn't take a lot of prep! We also made Christmas gifts for our families! After perusing 154 blogs and looking all over Pinterest, I went with a gift idea that my first grade teacher did when I was in first grade! I would show you the kids' finished ornaments, but their pictures are on them. So I'll just show you mine! We just painted popsicle sticks with either red or green tempera paint, and then I hot glued the popsicle sticks into this sled shape! There are two sticks hidden in this picture that would support the sled if you were to lay it down on a table. But it is meant to be an ornament. I am super happy with how they turned out! I just have to tie on the ribbons when I get to school in the AM. I'm not sure if I showed you the sweet tiny Christmas tree that I found in my closet last week. In their free time, the kids make paper snowflake ornaments for the tree and we just shove them onto the branches, haha! And lastly, over the weekend, I found First Grade Garden and this CRAZY cute writing activity! Amanda provides the rough draft PDF as a freebie!! And here's how they look on the bulletin board! Wish me luck for the partay tomorrow! All of the stations are set and ready to go, my presents for the kids are wrapped, and I am pumped! Love your ideas! The junk mail snowflakes are genius. BTW I graduated high school in 1992 so when I saw your little girl picture on that year I felt a little...OLD!!! 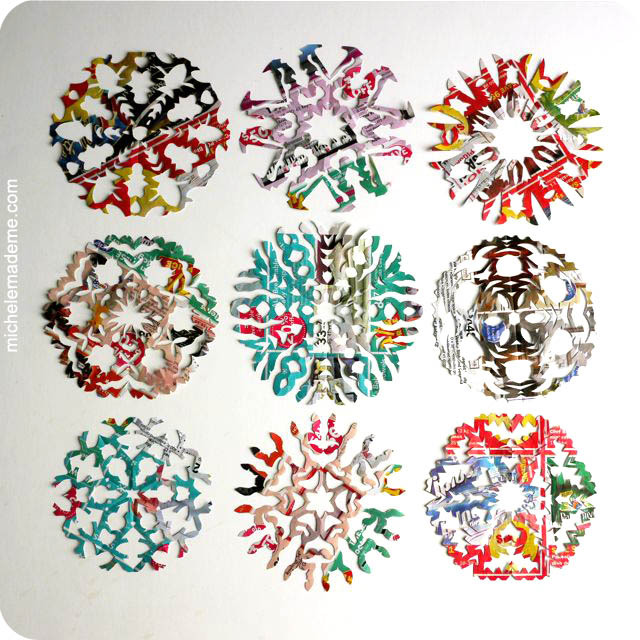 I love the junk mail snowflakes. Perfect!!!! Hope your last day goes great!! !